Drill it. Blast It. | Crush it. | Rock it. ARI performs rock drilling services in Oregon, Washington, Alaska, Idaho, California, Nevada, Colorado, Montana and Wyoming. 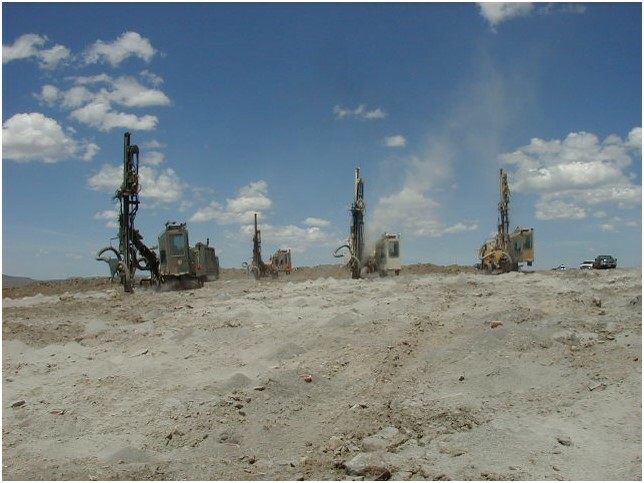 ARI has 31 rock drills available to service nearly any size of rock drilling project. For high-production quarries, and for pre-drilling applications such as, solar pile foundation drilling, ARI can drill up to a 10 inch diameter hole. For smaller quarries, and tighter spaces, ARI has smaller drills that can drill as small as a 2.5 inch diameter hole. ARI drillers are MSHA Part 48 and MSHA Part 46 trained, and can drill in surface mines of all types and sizes. ARI has several large diameter (up to 10 inch hole diameter) rock drills that are available to support your high-production rock quarry needs and your solar pile foundation drilling projects. If your project has challenging access restrictions, ARI is known for its innovation in completing difficult projects safely and timely. If your project is on a tight timeline that requires high production, our fleet can be quickly mobilized with a team of drillers to help you complete your project on time.